A man dreams every night of flying high in the sky and then tumbles down and wakes up. One day when the man-hawks come on the ground to fetch some of his fellow inmates, he rebels and fights them. He then climbs up again to reach the spaceship of the mysterious hawk creature who lords over the man-hawks and his brethren. Can Carter Hall stop the hawk-god’s terror? This story is a spiritual representation of Hawkman’s life seen through one of his reincarnating souls. It portrays the classic conflict in Hawkman’s life of rebirth and his animal avatar, the hawk being an opponent against him but also part of his being. Of all the other lives Carter Hall had, the one in Hawkman’s body appears to be the most accomplished and bolder. 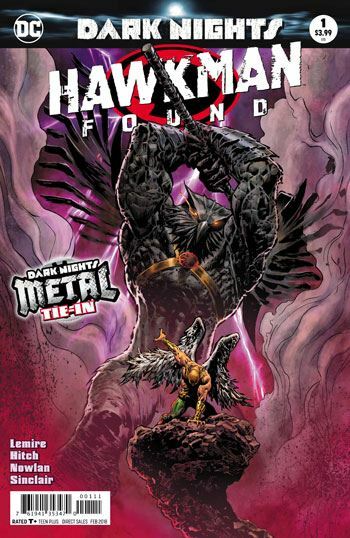 This first issue will not make any further sense, unless you pay attention to Hawkman’s history and how Jeff Lemire chose to represent it in a comic. The issue feels padded with not much happening but appearing to be spiritual and philosophical in tone. This comic appears to be a story of man versus self. Having skipped Dark Knights Metal, I do not know how Hawkman’s return fits with that crossover or the Death of Hawkman mini-series that ended in March 2017. Kevin Nowlan is a good inker for Bryan Hitch because he solidifies the looseness of the latter. The first version of Hawkman drawn by Hitch looked like the classic version without the trunk and much of the pouches and gear. He looked clean. The one that we see fly away at the end of the issue has a whole chest armour instead of a harness, and metal wings instead of the traditional feathery grey pinions. I’m less thrilled with this depiction of Hawkman.